Major Contract is a challenging 2D side-scroller where you must collect resources from planets in order to complete your mining Contract. Completing you Contract will not be a simple task. Gravity is low, so you must learn to control your boost pack properly and evade the obstacles. Your air is limited, and each planet is full of dangers, but you have a job to do. You can always upgrade your equipment, and improve your odds of survival... for a price. Various planets with different environments. 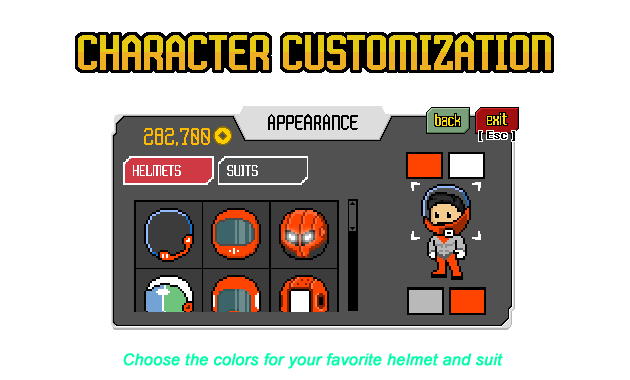 Character customization: Hundreds of possible gear/color combinations. We currently have the core of the game complete, so we are working on adding a variety. We want the gameplay to be dinamic and different on every planet that you mine. A fully featured PC game ( no mobile port stuff ). Mouse, Keyboard, and Xbox Gamepad support ( Each fully supported and customizable ). A wide variety of Enemies. Different Planets to explore, each with their own distinct obstacles and enemies. Last social media updates in March, last on developer site appears to be February. When is this game available? I want to buy a copy! It looks really good compared to most stuff on here...high production quality and music. I voted yes because it looks pretty good. Just dont be one of those developers that doesnt help the community or listen. But Good work and good luck! Nice cute 8bit art style.